Was this the end – again? 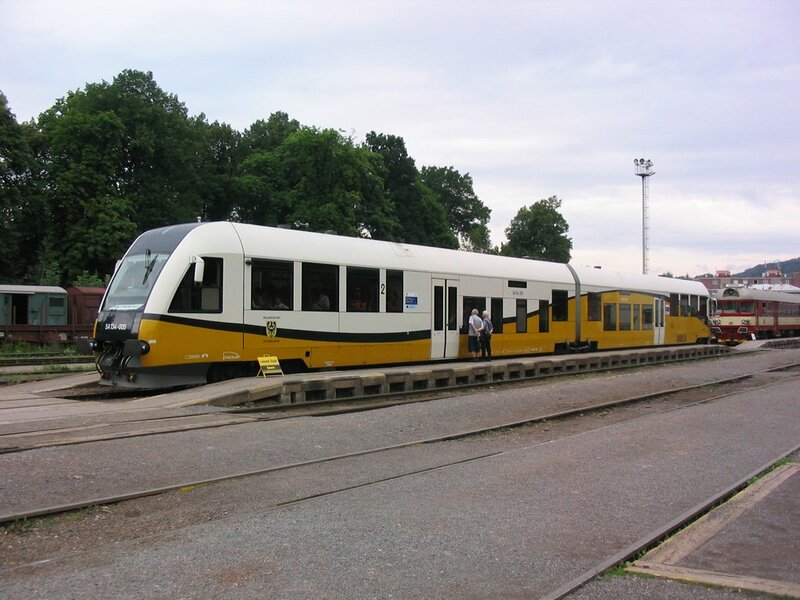 After allegedly finishing my Czech passenger track last time out, up came ČD and/or Viamont and/or PKP with a new service across the border from Královec to Lubawka, continuing to Jelenia Góra and Lwówek Śląski. Add to that engineering diversions between Praha-Krč and Praha-Radotín, the PSUL curve between Praha-Vršovice and Praha-Smíchov, the four train pairs per year (well, this year) curve from Velké Žernoseky to Žalhostice, the connection off JR 143 at Chodov and I found myself on my way back! Another final trip to .cz! Started with an on time-ish London Midland 170 to BHM, whence the 1130 Bendyleano (windowless reserved seat but only £12 TFC-EUS) to Euston. Left on time, 4 late at Coventry, 4 early at Euston. 90 minutes for 112 miles isn’t exactly a mad dash for a 140 mph kart. Went and had a look at the new St Pancras, not as stunning as I’d expected. And that blue roof … not really! Had a look in at KX too and watched trains for a bit before a lengthy stroll to Baker Street and a leisurely pint of tepid Exmoor Gold at the Metropolitan. It dawned just in time that the Hammersmith and City would provide a more interesting route to LHR so I did that instead of Bakerloo/Piccadilly. Piccadilly from Hammersmith of course but that’s above ground as far as Hounslow. Got a through T5 train so did the new bit without bother. T5 – well, yes, it’s an airport terminal. Efficient though; two cheery Travelex ladies [one from Poland who asked where I was going and was a bit stunned when I said Kamienna Góra] provided my pre-ordered CZK and PLZ, there was no delay or nonsense of any sort at security, and off I went. [No doubt being checked in on line and having only cabin baggage helped]. 1820 flight on an Airbus – left 1822, arrived PRG (booked 2120) in time for me to be outside, all ticketed up and waiting for the bus, at 2122. Well done BA (and the G&T was nice though the sarnie was truly disgusting). And so to the excellent Hotel Akcent by 119/A/B. It’s literally adjacent to the south exit at Anděl – Ibis level accommodation and air con for £30 (CZK918). What more could you want. Never moved until the alarm went at 0500! The shower was very welcome before a (just) successful dash for the 0535 tram from Pilzeňska to Vršovice. As I’d suspected, hence the early start, buying a rover wasn’t too easy with the booking office lady making heavy weather until her colleague stepped in to assist. Good job I’d written it all down, as ever, as that restricted the problems to the computer side of things. Difficult to identify quite where the Košice kipper would appear (particularly as it was removed from the display at 0624 sharp, some time before it actually appeared). I went for n3 on the advice of the yellow sheet, which turned out to be right. It rolled up 11 late behind 163 010 and duly did the ‘hl.n. avoider’ for me, handily not joining the line from hl.n. until just before the Vltava bridge. Decamped at Smíchov straight on to a ‘B’ which took me the one station to the hotel door for 0652. Breakfast (usual offices, with cake and fresh fruit) starts at 7 so that worked out well. I’d intended to tram it to Masarykovo just for interest but having dawdled over breakfast the metro was deemed expedient. I was comfortably ensconced in R772 (behind 162 053) at 0840 after reeling at the shock price increases at Pont (bottled water more expensive than at Heathrow, amazingly) and patronising Relay (1/3 the price) instead. Spot on punctuality to Lovosice (in fact early) but the bin for Úpořiny was surrounded by orange jackets and pax had just been ejected (reasonably, it was still facing south). Whatever it was got sorted in the end and we left 8 late. It got up to 12 then 10 but there are obviously huge chunks of recovery time as we only seemed to be a minute or two late at Úpořiny and the connection, with PR aboard, was waiting. So on to Bílina, doing the hoped-for diveunder and as a bonus, crossing back over to the south side. We had time to stroll back over to the northernmost island with the 363 just arriving with the Cheb train as we got there. There followed a series of farces. First the unit (an 814) wouldn’t report ‘doors shut’, causing 10 minutes delay. Then we waited for a connection off an eastbound Os at KV main station. Then for a southbound passenger at Stará Role, and then for a signalling (or points) problem, also at Stará Role. So our comfortable beer break at Nová Role got cut back to about 15 minutes, but we did manage a swift Gambo in a pub across the road at Nová Role. Train from Potůčky was 10 late so we waited for that, then finally our 810 (‘posh’ seats) got under way and I got to see the unexceptional line which is JR143, and do the connection at Chodov, in proper daylight. I could have done without the strenuous walk up the hill at Loket on a hot day – but the ‘home brew’ at the Hotel Císař Ferdinand was well worth it. Completely opaque and CZK45 the half litre [more than double the price of a typical pub pilsener] but really very pleasant. Wheelie bin back to Chodov was fine but the Cheb-Havlíčkův Brod ‘R’ and at the time of writing, approaching Chomutov, still is. It proceeded thus until Teplice where I decamped and caught the trolley bus to Řetenice where the Hotel Almond is (as reviewed) cheap, cheerful, spotless, friendly and remarkably good value for your CZK490. PR got caught in an OHLE farce and texted to say he was being diesel (742) hauled into Ústí on the goods lines. On the advice of the hotel I retired down the road to the local four ale bar/restaurant which presumably does well from Hotels Almond and Helena. Perfectly OK, with a cheery and very hard working waitress/barmaid, and provided me a stuffed turkey schnitzel (not quite as per menu). The walk to the station seeming to be at least 20 minutes I’ve abandoned that idea and settled for an early bus to Teplice tomorrow. Off to Ústí where breakfast was obtained and PR reappeared, then on to an 83-something (Liberec ‘R’ working) to Děčín hl.n. 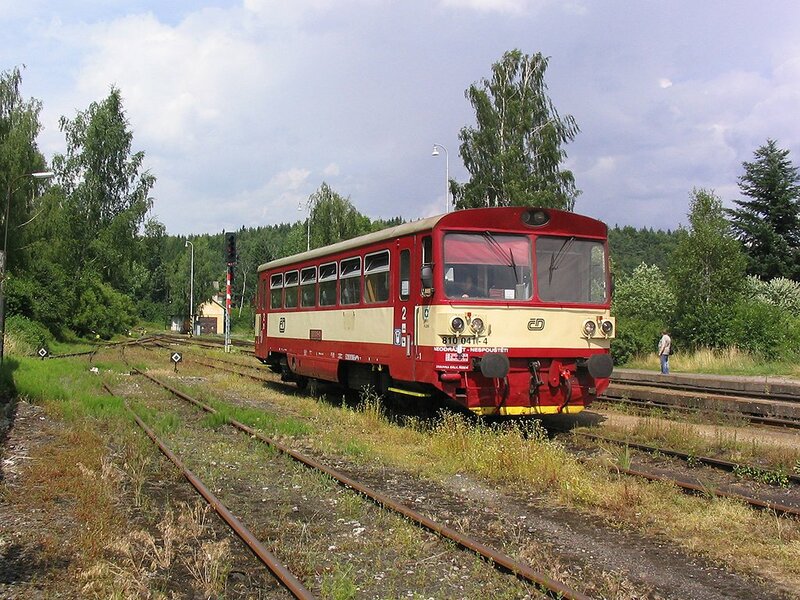 and an 810 to Velké Březno. Farce then ensued with no sign of the 0844 to Ústék, booked to do the JR072-087 curve. We eventually elicited that it was cancelled because the stuffed kart (M131) had broken. PR departed on the 810, now working the 0924 to Děčín, and I went back to Ústí on the 0935 bus. Both of us were lucky as there were no more trains or buses for over 3 hours. Leaving the bus at Ústí hl.n. I got a Most train as far as západ, to await 1045 ‘R’ to Nymburk and Kolín which I’d originally intended to pick up at Litoměřice after doing the curve. The train thrashed cheerfully and punctually along as far as Lysá (though missed the Štětí stop for some reason). I’d decided to take a PNB just before Nymburk and had just got there when I was bounced off the walls by the mother of all emergency stops. Clearly it was too late – emergency services were on hand with commendable speed followed shortly after by a helicopter. R790 Letohrad-Praha was stopped briefly beside us on the other line then allowed to go. Not unnaturally, we went nowhere. 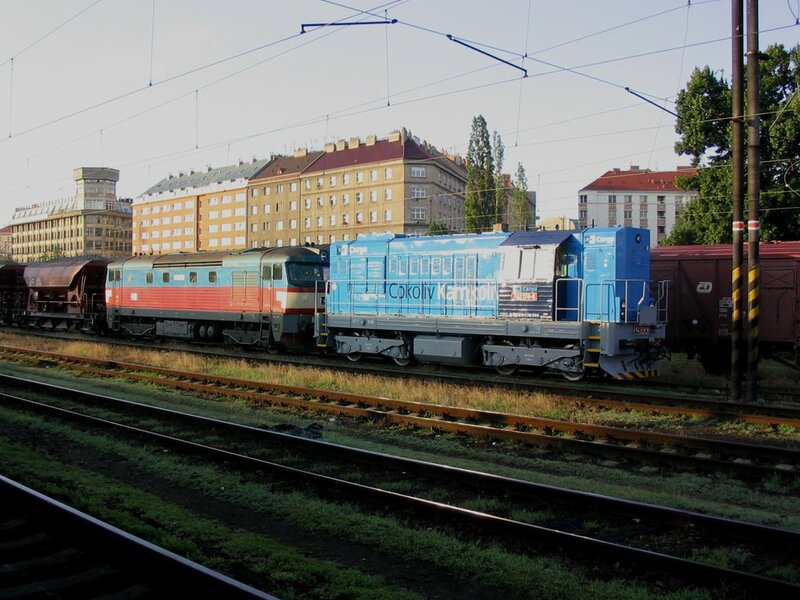 ČD were on the case though, and stopped the following Os9417 Praha-Kolín City Heffalump alongside us. Everybody was decanted off R717 on to the Heffalump (blessedly air-con!) and off we went. Noticed the locals very quick to blag seats in the first class even though there was room elsewhere … Sadly there were no English speakers around and I wasn’t able to find out exactly what had happened. Dramas over, at least for the unhurt, it soon became obvious that we wouldn’t make Nymburk for my connection at 1256. The Heffalump pulled up at 1303 – to my delight the 1256 was showing 10 late. Just enough time to get a bottle of Nymburk Postřižinské from the bothy! 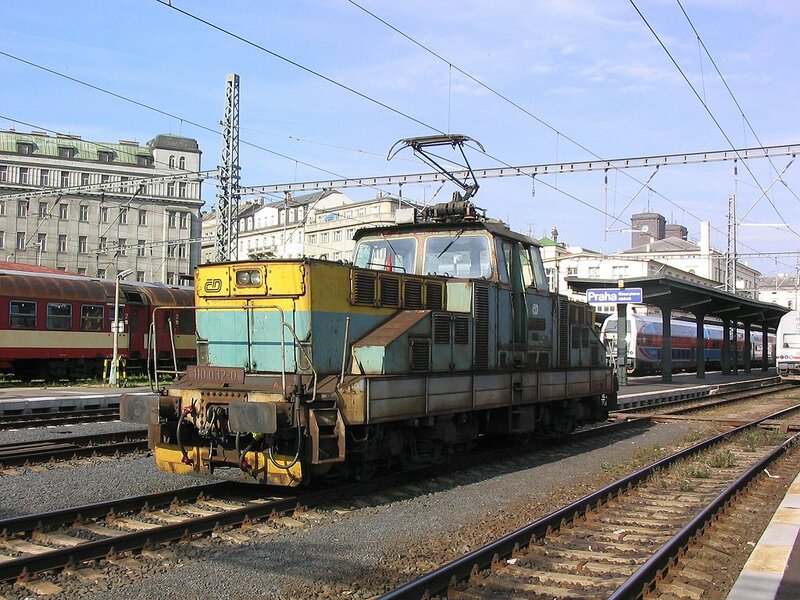 163 244 was the haulage for the Trutnov train, exchanged at Hradec Králové for 749 011. Also noted at HK was 854 022 whose trailer had a first class section, surely a recent innovation. Passed another trailer compo en route to Trutnov – not much else happened apart from being held to pass a southbound Sp (with Goggle) and ending up 20 minutes late. Under the circs I could hardly complain and in any case I had 2½ hours to kill in Trutnov so it didn’t matter. Retired to the Krakonoš Hotel (and brewery tap), a pleasant establishment with a beer ‘garden’ (slabbed) ideal for a warm day such as this. I took the opportunity for some fodder just in case! There’s a brewery shop which, like most other things in Trutnov, doesn’t open on a Saturday afternoon or Sunday. Back at the station the two dreadful buffets (see 6.5.05) have gone, to be replaced by a single spick and span shop/stand-up where the smokier but less dangerous of the old ones was. Improvement? I’m not sure … it sold Krakonoš at CZK14 though. The Polish kart, one of Dolnośląskie’s nice new SA134s, was ready and waiting – for some reason left 10 late, full and standing. Strange grippage arrangement with Viamont collecting fares to the border (Kralovec Gr.) and PKP coming round for the rest at Kralovec. The whole thing amounted to CZK21 + PZL4, about £1.60. Two ostriches noted en route – not beer goggles, they were still there the next morning! Interesting arrival [at Kamienna Góra] as we slid gracefully to the end of the platform and had to back up. Rain and profuse vegetation were to blame as the driver had approached with suitable caution and then some! Hotel was located easily enough as it’s just across the road. Full scale linguistic problems but eventually it was ‘Ah! David!’ and all was sorted (though I had to change rooms to my allocated one). I had a wander round the (rather unprepossessing) town, encountering a wedding at the registry office – strangely I thought, at 19:30. Paused for a Warka at the café in The Square and thought I’d been charged tourist price at PZL4.50 (just over a pound). But no, the little bar opposite the hotel sold Piast at the same price, and had it marked thus on the price list. Clearly they apply more tax in Poland than in the Czech Republic. [I suppose this might account for the fullness of the train, though there was absolutely no disorderly behaviour]. Back at the hotel it was nightmare time with the disco so loud my room was actually vibrating despite not quite being above. The early start and the day’s beers put paid to that, though, and I got a reasonable night’s sleep in the end. 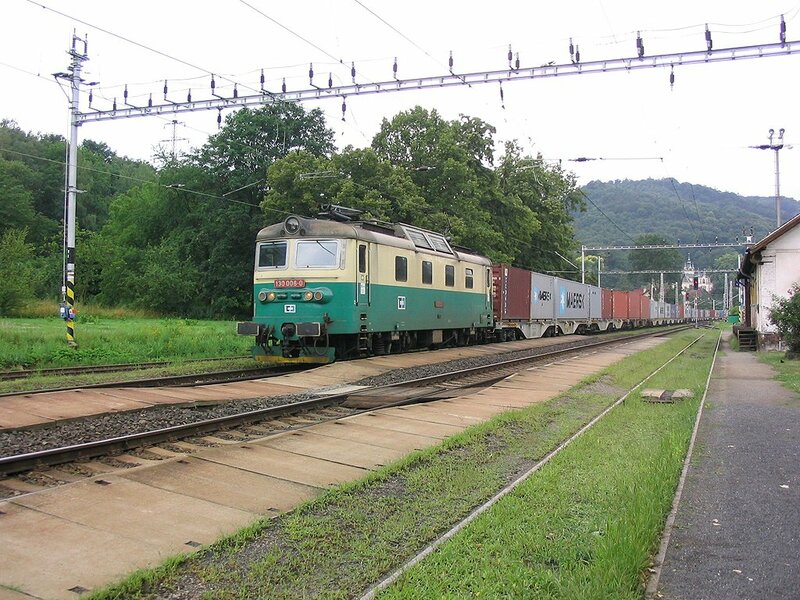 As we 'enjoyed' a futile wait for a cancelled train at Velké Březno on 12.7.08, 130 006 passed on a northbound freight. SA134 005 waits to work Os 39406 17:51 Trutnov hl.n. - Lwówek Śląski on 12.7.08. Awoke to a temporarily fine morning. Breakfast was a long time coming but pleasant enough (fresh scrambled eggs) when it arrived. Despite the noise, a reasonable stay. A hopeful crowd was assembling at the station, disconcerted by the posted timetable which bore absolutely no resemblance to the real one (I think it was the first one published before the service started). The train turned up 23 minutes late, and with the Kamienna Góra contingent, was about ¾ full. 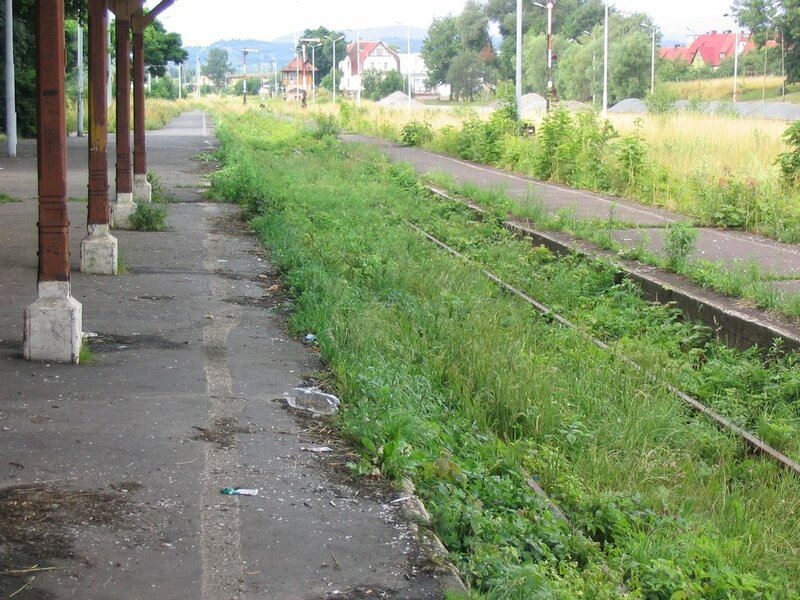 It lost time reasonably steadily, making my 21 minute connection look unlikely, but I then remembered I could leap at Trutnov-Poříčí. We arrived there at 0937, making the 0943 Os an easy connection. It was late anyway (maybe waited at hl.n. for the PKP train?) but pleasingly was formed from 854 213 with one of the compo trailers. At the time of writing (Olešnice) it’s 12 late; connection at Jaroměř is 11. Oh well, I expect they’ll hold it. They did, and it left only a couple of minutes late. Delayed slightly waiting connection at HK – arrived at Pardubice with 3 minutes left of the 6 minute connection to R702. I missed the preceding Ex by seconds having stopped to check the platform for R702 which like the Ex was billed as 10 late. I nipped across to the Relay to get a can, only to discover that R702 was booked to have a buffet car. Imagine my smug feeling when it turned up, 12 late and sans buffet! 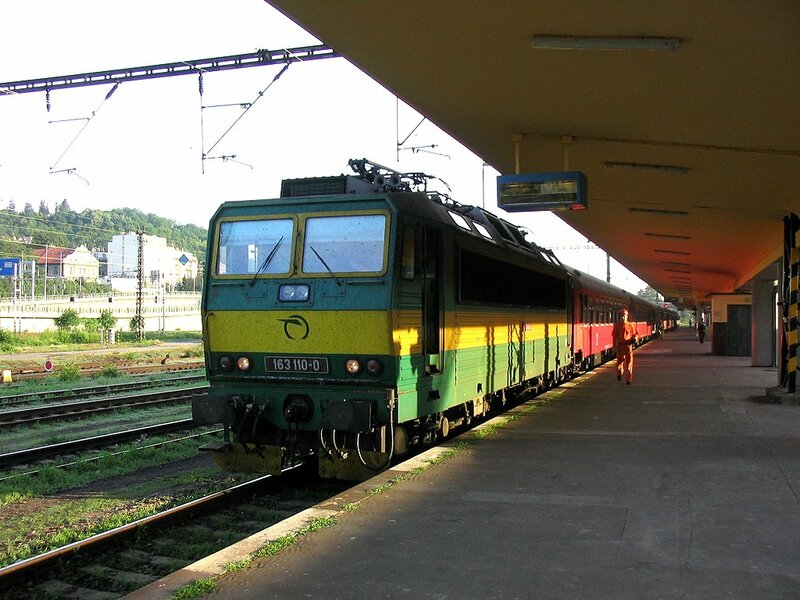 ČD got their own back with a dismal run to Praha-Vršovice and hl.n. [via the freight diversion I took such trouble to do on 27.2.07], arriving 16 late and in time for me not to get the planned metro/bus to Zličin and the Pivovarsky Dvůr. I decided to go on the next circuit two hours later and used this time to trundle up to the hotel and book in, check in on line (free Internet at the hotel) for tomorrow’s flight home and verify various train times, pub menus etc. Off to Zličin then, arriving in a very heavy duty thunderstorm and getting completely soaked locating the bus stop despite having a reasonably accurate idea from the maps on the DPP website where it was. [I find a ‘stubby’ umbrella a very useful item to have in my baggage. I also travel with a ‘cabin-baggage-sized’ rucksack whenever possible, and due to the wretched security rules I can’t take my brolly on a short trip like this one so have to put up with whatever’s thrown at me. Harrumph!] No harm done though [you’d think there was, after all that harrumphing!] and the very efficient on board announcements made it very simple to get off at the right pace and get wet again! Pivovarsky Dvůr is very much a smart food operation, but perfectly accommodating of those who just want a beer. It just isn’t a ‘sit and have a few beers’ sort of a pub. Beer and staff were both very pleasant though, making for a worthwhile visit. Almost dry for the return trip, using preknowledge of the layout at Anděl to reach tram 10 which took me direct to Štěpánská for a meal and a couple more beers with PR at Pivovar Dům. He retired to Vršovice for the very late running 2048 to Smíchov; I to the Krušovice beer hall (aka pivnice) in Národní třída for the reputed ‘yeast beer’ which turned out to be our old friend Schöffenhofer Weizen. I settled for half a litre of ‘Cooper’ which is the equivalent of our pint of mixed. Nice enough. Then by tram 9 and metro B to Smíchov for the 2224 to Beroun, a Plzeň ‘fast’, rejoining PR, who’d got there on the preceding Os, at Beroun. Successful bash of the Radotin-Krč goods line on the way back aboard 2308 from Beroun, (EN377 Františkovy Lázně-Budapest/Košice) which was the statutory 16 minutes late at hl.n. Straight on to a tram to Lipanská, so back in the hotel for 0020. Up far more betimes than I’d like, for 0346 tram to hl.n. where the 0416 return working (EN376 Budapest/Košice-Františkovy Lázně) was advertised 30 late. I could have done with the kip. Turned out 45 in the end, which played into our hands for once as we had full daylight by Krč, and a most satisfactory bash of the other side of the flyover. And so to (maybe) my last Czech train, ironically one of the disgusting, graffiti’d 45x/46x/whatevers. You can tell how interested I was in it. What a way to finish a generally very interesting country. It remained only to get home, which I tried not to do, by getting mixed up with new tram routes. Though going the way I’d intended I didn’t allow for the infrequency of service so ended up at gate A3 with 11 minutes to spare. But hey, that’s 10 minutes more than you need! Airbus back, left early, double ration of gin as an award for declining the ‘sandwich’, arrived early and I was at the T5 UndergrounD entrance 3 minutes before booked arrival time. And so to Brown’s Britain. ‘Paddington is closed due to a security alert, we won’t be stopping there’ (this on a Hammersmith & City train). ‘Paddington is open again, Paddington will be the next stop’. Emergency services present, office staff trooping back in. Fire engine trying to get down Praed Street to a different emergency, muppets in cars/taxis oblivious, uncaring, self-centred, ‘it’s not my life they’re saving’. One could say uncharitable things about them, but perish the thought. Archery Tavern no longer a pub [since 3.1.06 I discovered later], maintaining the tenor of the afternoon. Mercifully the Monkey Puzzle in Sussex Gardens is, and a Hall & Woodhouse one at that! After a pint of Tanglefoot, on from there via some fricasséed rat and chips to the Metropolitan where Everards Hazy Days certainly was (hazy). The second time in ten days that I’d encountered this beer, which is a fully paid up German weizen style, and none the worse for that, though why the Metropolitan serves its beer so warm, especially one that cries out to be cold, is a source of wonder. Finally to London Eusless where no platform was allocated to the 1810 Wolvo. It eventually appeared in P3 sans destination displays inside or out, and with paper labels for the seat reservations. 9 minutes late by Watford Junction, good to know we can keep up with the Czechs. ‘Slightly delayed’ he says. 9 minutes on a 15 minute journey… Stopped again at Kings Langley, then proceeded for a while along £8bn worth of WCML at 40 mph. It then got a lot better with a spirited run to Coventry and Birmingham Irrational where Something Was Up as we stopped inexplicably in P2 instead of the usual P3. The Proof House Force Field had been specially extended and we proceeded at 40 mph to Proof House Junction where we were held for a Derby line DMU. This little classic from Network Rail lost all that we’d gained and had us 20 late into New Street, just in time to miss LM’s 1957 to Salop which had just gone. So I stayed with VT (who were probably as cheesed off as I was) to Wolvo, hoping in a foolish kind of way to get the 2050 Aber forward to Telford [but not daring to wait at Birmingham for it, knowing how often ATW trains are turned back at Wolverhampton]. Seeing the inbound Aber caped at Wolvo gave me a hint of what was to come, and further enquiry revealed it to be 75 late and counting. So as it still hadn’t arrived at Wolvo by 2116 I ended up in the immaculate, impeccably punctual, and smartly recarpeted and reupholstered 170 forming LM’s 2116 to Telford, finally reaching the sanctuary of the All Nations by taxi at 21:58. Not a particularly good advertisement for the British rail ‘system’. A Significant Birthday was imminent and it was time to look for (railway) pastures new to celebrate it. In August I set off on the first of two trips to Austria.